Go through and relax it, especially, the middle area: the diaphragm, the stomach and the lower abdomen. This is where the inhale is either longer or shorter than the exhale. For example, your inhale is short and your exhale is long or your inhale is long and your exhale is short but they’re not of the same length. Avoid this kind of breathing. In the inhale or the exhale, instead of being a continuous, unbroken movement, it stops, breaks off and continues. It’s jerky. In the exhale, it’s the same thing. Often, you can correspond the relationship of your breathing to your state of mind. If you’re agitated or excited, your breathing will be uneven and broken. That’s one way to measure what’s going on with the thought process. This is when you’re using force or energy to inhale or exhale. It’s the kind of thing you see in martial arts movies before someone does something dramatic and unleashes their move where the bricks break, etc. This kind of breathing is too controlled, too muscular. Avoid this. If you try this breathing, you can feel your whole body tighten up. There’s a rigidity that occurs in the body and this is the opposite of what you want to happen. You want to have a very young child’s body like a one year old or younger when they’re sleeping. This is not a recommendation to sleep. Your goal is have your body be as loose and relaxed as a sleeping baby’s. It’s a breathing that takes place completely on its own. You don’t have to attend to it. It’s very natural. Once your body is in correct position and everything is relaxed, and your mind is focused on your meditation topic, the breathing will naturally come in and naturally go out in a very even, unbroken, unforced way, effortlessly. That’s the wonderfulness about this. You don’t have to aim to develop chan breathing. It’ll happen naturally when the posture and the positions are right and when your mind develops its focus. The breathing will then take care of itself very naturally. The more you concentrate and the more you practice this, the breathing will become softer, more indistinct, and less traceable. The texts say you’re breathing but it’s like you’re not breathing. It’s like you’re not breathing yet you’re breathing. It’s so quiet, so natural, that you don’t even notice it. This is the kind of breathing you want to let happen. I don’t want to say it’s the kind of breathing you want to ‘practice’ but the kind of breathing you want to let happen. Let that breathing happen. Generally, if you want to measure your stress or anxiety, just pay attention to your breathing. It will tell you immediately where you are. The next time you are angry, jealous or fearful, take note of your breathing. Check if it’s gone into one of these uneven, broken, forceful, disruptive, and unnatural ways of breathing. The deep chan breathing will happen without any effort and just take care of itself. Once you get into this chan breathing and deepen your meditation practice, it’s possible that someone from the outside won’t even think you’re breathing! If they observe you, they won’t be able to visually detect that you are breathing. They may not see your chest rise and fall with each breath. It’s so relaxed, so deep, and so natural. There’s hardly anything going on and yet you don’t feel constrained. You don’t feel like you have to take a breath. It just settles and disappears by itself. 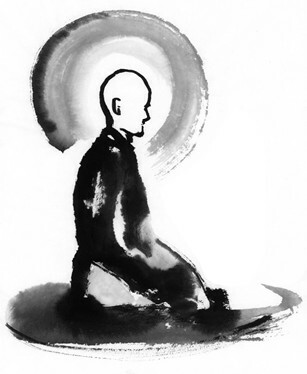 The next lesson will discuss different meditation practices with the mind. One practice is to use a certain technique where you layer your concentration following the breathing. Once the breathing starts to get into that natural rhythm automatically by itself then you can layer your concentration on top of that. Your mind is going into its meditation topic with the breathing. You’re not directing the breathing. You’re following the breathing.